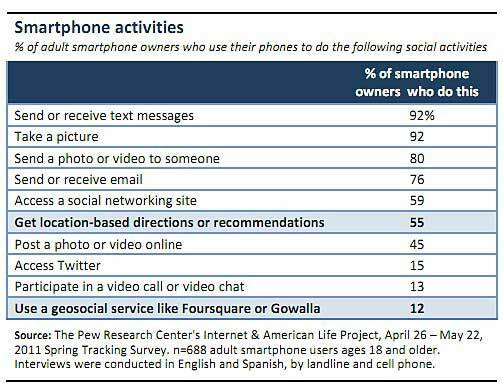 Only 12% of adult smartphone owners in the US say they use their phones to check in with geosocial services such as Foursquare and Gowalla, whereas 55% use their smartphones to find location-based directions or recommendations, according to a new report by Pew Research. Nearly six in ten (59%) smartphone owners use their phones to access social networking sites, while 15% use their devices to access Twitter. Overall, 42% of US adults who own a cell phone own a smartphone (i.e., 35% of all US adults own a smartphone), according to Pew; among them, 58% use a geosocial or a location-based information service of some kind.